Ed. note: This post was originally published on energy.gov. 10. Human civilizations have harnessed wind power for thousands of years. Early forms of windmills used wind to crush grain or pump water. 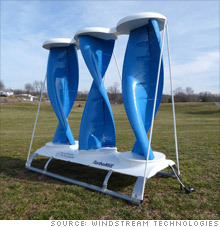 Now, modern wind turbines use the wind to create electricity. Learn how here. 9. A wind turbine has as many as 8,000 different components. 8. Wind turbines are big. A wind turbine blade can be up to 150 feet long, and a turbine tower can be over 250 feet tall, almost as tall as the Statue of Liberty. 7. Higher wind speeds mean more electricity, and wind turbines are getting taller to reach higher altitudes where it’s even windier. See the Energy Department’s wind resource mapsto find average wind speeds in your state or hometown. 6. Most of the components of wind turbines installed in the United States are manufactured here. Facilities for building wind turbine parts are located in over 40 states, and the U.S. wind energy industry currently employs 75,000 people. 5. The technical resource potential of the winds above U.S. coastal waters is enough to provide over 4,000 gigawatts of electricity, or approximately four times the generating capacity of the current U.S. electric power system. Although not all of these resources will be developed, this represents a major opportunity to provide power to highly-populated coastal cities. See what the Energy Department is doing to develop offshore wind in the United States. 4. The United States generates more wind energy than any other country except China, and wind accounts for 35 percent of all newly installed U.S. electricity generation capacity over the last four years. 3. The United States’ wind power capacity reached 47,000 megawatts by the end of 2011 and has since grown to 50,000 megawatts. That’s enough electricity to power over 12 million homes annually — as many homes as in the entire state of California — and represents an 18-fold increase in capacity since 2000. 2. Wind energy is affordable. Wind prices for power contracts signed in 2011 are 50 percent lower than those signed in 2009, and levelized wind prices (the price the utility pays to buy power from a wind farm) are as low as 3 cents per kilowatt-hour in some areas of the country. 1. As much as 20 percent of our nation’s electricity could come from wind energy by 2030but continued support for clean energy tax credits is critical to achieving this target. That’s why President Obama is calling for an extension on the Production Tax Credit — to support wind producers in the U.S. and continue to help drive the wind industry’s growth.